Clutter… does it produce Chaos or Creativity? There are varied findings on the effects of clutter in the home or workplace. According to a study published in 2011 by the Princeton University Neuroscience Institute, the more visual stimuli in our environment, the less we are able to focus. According to this research, an uncluttered and organized home and office will help reduce irritability and distraction. It will also promote productivity and better information processing. Clutter can drain us of energy and interrupt some of our daily processes, like getting to work or school on time. For some, however, a messy desk can spark creativity, according to a recent study by Kathleen Vohs and colleagues at the University of Minnesota. Results from one of their experiments showed that participants in a disorderly room were more creative than participants in an orderly room. Have you ever been frustrated by not being able to find a bill or invitation? Does your child frantically rush to find his backpack, shoes or library books in the final minutes before the school bus comes? Is it a challenge to coordinate your family’s many activities on a central schedule? My recent frustration with all of these scenarios led me on an organization journey for a few trouble spots in my home, namely paperwork and the family “drop spot” (where everyone dumps their belongings once inside the house). There’s an old saying that still rings true… have a place for everything, and put everything in its place. The first part of that takes some trouble-shooting; the second part takes forming a habit to maintain the organization. To help create a “place for everything,” I conducted an online search using terms such as ‘family command center’ and ‘family launch pad’ and collected a lot of ideas and pictures. 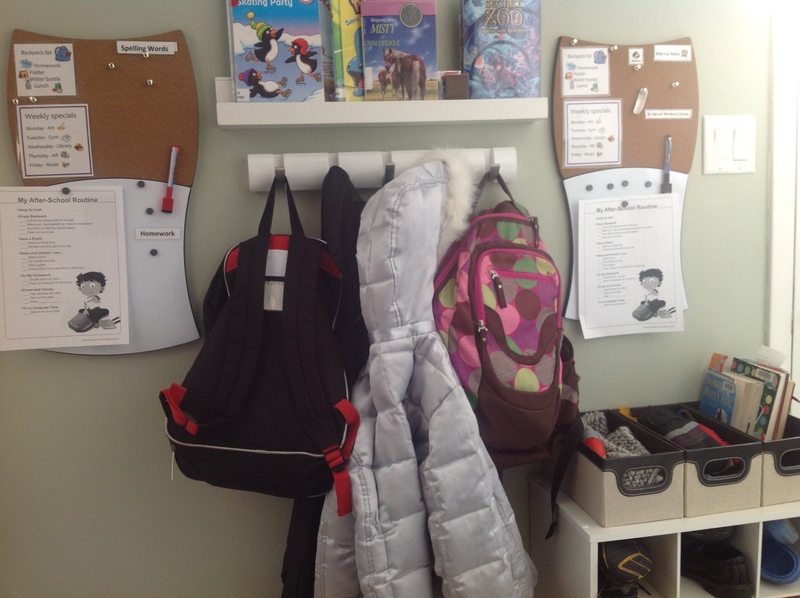 Then I figured out where the problem spots were in my home and what organizational tool or process might help with that. With concern for saving space, time, and money, I was able to solve most of our issues by adding a few cubbies and hooks where needed. Putting everything in its place… ah, this is a continuing adventure, one that I’ve brought my whole family on. Sometimes we need to remind each other to put our shoes away instead of in the middle of the floor (myself included). Overall, the time and effort put into organization has made a big difference in keeping our living area more tidy. It has also helped us in getting out the door in the morning with a little less chaos. So if you notice clutter becoming a frustration, steps to tame it for your situation may start you on you a journey of your own.